"The opera was successful at its appearance – ‘A Stirring Ovation...Reception of Hanson-Stokes Opera most Enthusiastic of 10 Years at Metropolitan’, read the headline on page 1 of the second section of The New York Times - but audiences seemed more pleased with the piece than did the critics." 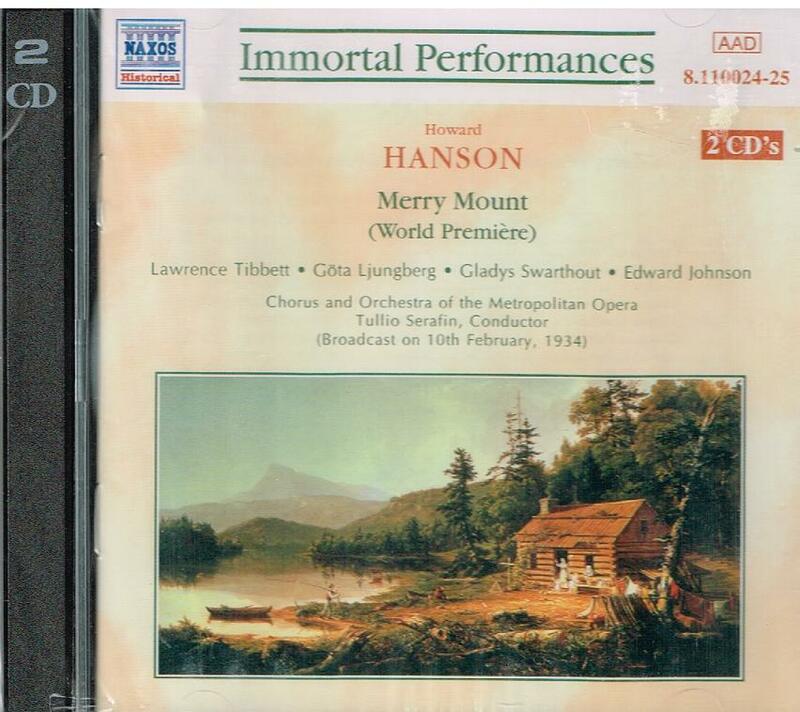 “MERRY MOUNT is an opera in three acts by American composer Howard Hanson; its libretto, by Richard Stokes, is loosely based on Nathaniel Hawthorne's short story THE MAYPOLE OF MERRY MOUNT, taken from his Twice Told Tales. 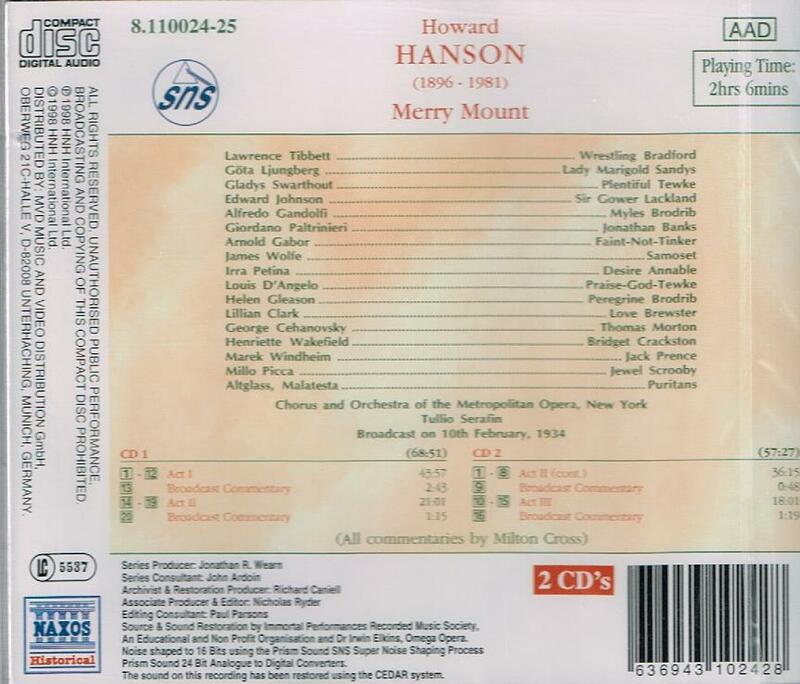 Hanson's only opera, it was commissioned by the Metropolitan Opera in New York City. The opera received its world première in concert at the fortieth annual May Festival of the University Musical Society in Ann Arbor, Michigan, on 20 May, 1933, with the composer conducting the Chicago Symphony Orchestra. The cast included Leonora Corona, Rose Bampton, Frederick Jagel, Chase Baromeo, John Charles Thomas, and George Galvani. Its world stage première by the Metropolitan Opera was given on 10 February, 1934. As that performance took place at a Saturday matinée, it was broadcast nationally as part of the company's weekly radio series, with Milton Cross serving as announcer. The première featured Lawrence Tibbett in the central rôle of Wrestling Bradford, the Puritan minister, with Gladys Swarthout as his betrothed, Plentiful Tewke. Swedish soprano Göta Ljungberg and Canadian tenor Edward Johnson took the rôles of the Cavalier lovers, Lady Marigold Sandys and Sir Gower Lackland; Tullio Serafin was on the podium. The opera was performed eight more times during the season, but never returned to the Met's repertory, and subsequent performances have been scarce. MERRY MOUNT is unusual in that its libretto was written without a composer in mind. Stokes had conducted comprehensive research into Puritan fanaticism, sexual obsession, and demonology; he found that it often reached pathological levels, and usually ended in death as a form of punishment, or redemption, for its victims. While he found his title in a story by Nathaniel Hawthorne, Stokes crafted an original libretto which some compared to THE SCARLET LETTER. Upon completion of the text, Stokes went in search of a composer, finally finding one in Howard Hanson. Hanson, for his part, was new to the composition of opera, although he had already written a fair amount of choral music. Still, he was already respected as an elder statesman of American classical music, and such was his reputation that the Metropolitan was convinced to commission the work. MERRY MOUNT would be the fifteenth American opera, and the last but one, presented at the Met during the tenure of Giulio Gatti-Casazza as company director.